David Stillman traveled to Haiti to work with leaders of SImACT, Inc. and the Global Investment Summit to plan a Haiti Reconstruction and Sustainability Summit, to be held in Miami in September. On February 11, Jeanne Stillman co-chaired the United Nations Association of the USA Mid-Atlantic Conference and Members Day at the UN. Over 550 persons attended. For details, check out the UNA Southern NY blog. David Stillman addressed the Disaster Response and Recovery Summit in Orlando, Florida (March 1-2) and was keynote speaker at the Sustainability Dialogue at Maricopa Community Colleges, Phoenix, Arizona (March 3-4). See the Public-Private Alliance Foundation website for details. David Stillman participated in a conference held by the Chambers of Commerce of Haiti and of the Dominican Republic, with other partners. He then led the Workshop on "Business and Reconstruction in Southern Haiti," attended by business people who participated in the Chambers of Commerce meeting and by others based in Haiti. Over 100 people participated. On February 24, David Stillman spoke at the United Nations Department of Public Information / NGO Communications Workshop: “NGOs responding to crisis: Meeting new challenges – The case of Haiti" on the work of the Public-Private Alliance Foundation in Haiti and related work in the Dominican Republic. David Stillman participated in the Aquaculture workshop held in Santo Domingo, Dominican Republic for the purpose of developing the next five-year national plan for aquaculture. He had earlier worked with ADOA, the Dominican Aquaculture Association in January to plan the workshop. He then traveled to Haiti six weeks after the earthquake struck, traveling by SUV across the Dominican Republic. This trip was made in part to plan a conference in Jacmel, Haiti. David Stillman traveled to the Dominican Republic to meet with organizers of an upcoming workshop to develop the next five-year plan for Aquaculture. The devastating earthquake struck in neighboring Haiti on June 12, while he was visiting a fish farm. David then met with local Dominican and United Nations officials concerning steps that could be taken to help Haiti. The Board of the Public-Private Alliance Foundation met while he was still in Haiti to discuss how to help in the rebuilding. On October 20, at the annual meeting held at the National Arts Club in Manhattan, Jeanne Betsock Stillman was elected President of the United Nations Association Southern New York State Division. ​From October 7 - 9 David Stillman and colleagues led the Bioenergy International Debate in the Dominican Republic, the third in a series of meetings organized by the Public-Private Alliance Foundation and colleagues. Information on the event is available on the PPAF website: www.ppafoundation.org David's opening remarks are available on PPAF's YouTube channel: www.YouTube.com/ppafoundation. David and Jeanne Stillman organized the Public-Private Alliance Foundation's June 17 Ethanol and Bioenergy event at United Nations, which focused on financial sector opportunities and challenges for bioenergy. Again the event again used Business Model Innovation methodology. David opened the event with an overview and Tom Kadala of ResearchPAYS, Inc., which co-sponsored the event, acted as facilitator. Twenty-five senior professionals from business, academia, governments, the United Nations and non-governmental organizations attended. More is available at: www.ppafoundation.org . David Stillman spoke at the United Nations Association Council of Organizations at its event on April 23: The changing nature of corporate-civil society partnerships in the global economic downturn. Olajobi Makinwa, Civil Society Coordinator, UN Global Compact will also speak, and Tom Kadala, ResearchPAYS, Inc., also spoke. The event took place at the Church Center for the UN, 777 UN Plaza, 44th and 1st Ave., New York, and was open to the public. His other speaking engagements this month included: an International Relations Class taught by Dr. Greg Julian, head of Political Science at Pace University (April 14), on the subject of renewable energy and community development in the Dominican Republic; and a meeting with faculty and students from the College of New Rochelle at the Mission of the Dominican Republic to the UN, on the subject of work in the Dominican Republic toward the UN Millennium Development Goals (April 17). On April 16 he joined a panel organized by the NGO Committee on the Status of Women Subcommittee on Older Women and the NGO Committee on Migration, to address The Global Impact of Migration on Older Women. His discussed outcomes of the Regional Consultation on Migration, Remittances and Development in Latin America and the Caribbean, held in the Dominican Republic in July 2006, which he helped organize. The Dominican Government submitted results to the UN General Assembly. David and Jeanne Stillman held two seminars with Master of English in International Affairs students at the EF International School of English in Tarrytown, NY. One seminar focused on the United Nations and followed up on a Conference attended by the students on February 6 at the UN: Year of Change: New Prospects for America at the UN. The other seminar focused on partnerships in the context of development, with special emphasis on the United Nations Global Compact. David Stillman traveled to the Dominican Republic with colleague Tom Kadala of ResearchPAYS, Inc., to work with the National Energy Commission and the Ministry of Foreign Affairs to organize a Bioenergy International Debate, to take place in October. On May 28, David and Jeanne Stillman served as judges for the NFTE Business Plan Competition at Saunders Technical and Trades High School in Yonkers, NY. NFTE, the National Foundation for Teaching Entrepreneurship to Youth, holds competitions around the country. County winners compete for a national prize of $10,000. On May 16, David and Jeanne Stillman led a seminar on the United Nations System for a Master in English in International Affairs Class at EF International Language School in Tarrytown, New York. David Stillman attended the Agroalimentaria (Agricultural Fair) in Santo Domingo, Dominican Republic, to work with Dominican businesses, government and investors in the fields of greenhouse vegetables, fruits, fish farming and other agrobusiness. On behalf of the Public-Private Alliance Foundation David Stillman visited the Dominican Republic to meet with greenhouse vegetable producers, buyers from Hunts Point Market, New York City, aquaculture leaders, Dominican government personnel and US Agency for International Development staff and contractors to discuss growth of agribusiness. David and Jeanne Stillman organized PPAF's "Partners Against Poverty" event, held at the United Nations on July 16. Over 70 people representing UN organizations, governments, the business sector, and non-governmental organizations participated. David Stillman chaired the event, which featured presentations from UN System organizations as well as small group discussions on renewable energy, agribusiness, sustainable tourism, health, and women, entrepreneurship and microfinance. On behalf of the Public-Private Alliance Foundation (PPAF) David Stillman participated in the Sustainable Tourism Conference in Santiago, Dominican Republic. The Conference, which was convened by the Dominican Government and US Agency for International Development, met to discuss sustainable tourism issues and to make possible discussions by "clusters" from regions around the country. Strategies for Development has entered into a three-year agreement with the Public-Private Alliance Foundation to provide management services and office space, including David Stillman's service as Executive Director of the Foundation. In late June David Stillman and a colleague whose family owns a sugar cane plantation and port in the Dominican Republic met with other owners and workers as well as banking officials, to explore possibilities for sugar cane-based ethanol production. Stillman also met with leaders in fish farming and vegetable production. Upon his return from Madagascar, David Stillman traveled to Atlanta to participate in a board meeting of JumpStart International, as well as to meet with Carlos Pimental of Esperanza International, which works with communities in the Dominican Republic. 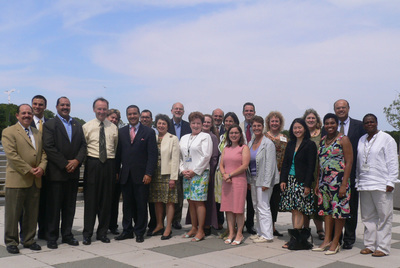 From June 7 to 10, Jeanne Stillman participated in the Annual Conference of the United Nations Association of the USA. She chairs the Sub-Committee on Communications of the Council of Chapters and Divisions Steering Committee. She also presented "best practices" including on the award-winning Going Global with the UN video series which she directs. With the Ambassador of Madagascar to the United Nations, Zina Andrianarivelo-Razafy, David Stillman and PPAF board member Scott Wright participated in the Madagascar Action Plan Partners Roundtable, an invitation-only event. MAP is the government's plan for poverty reduction. Participants included governments, business, non-governmental organizations, and other partners or potential partners. David and Scott Wright also visited the port city of Toamasina, where they visited medical and preventive health facilities. David Stillman served as Emcee for "Partners Against Poverty," the launch of the Public-Private Alliance Foundation, which took place on May 18 at a luncheon at the United Nations Delegates Dining Room. Speakers included Ambassador Leo Merores of Haiti, Vice Chair of the UN Economic and Social Council; Ambassador Zina Andrianarivelo-Razafy of Madagascar; Ambassador Francis Lorenzo of the Dominican Republic; Georg Kell, Executive Head of the UN Global Compact; Dr. Hanifa Mezoui, Chief, NGO Section of UN Department of Economic and Social Affairs; and Mr. Daniel Mejia, Chair of the Public-Private Alliance Foundation and Chair of Sun Land Group Corporation. 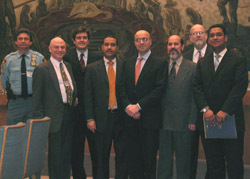 Representatives of Intel; the European Bank; Pure-Tek, Inc.; the University of South Florida Patel Center; the University of Oklahoma InfoPoverty Center; the UN Department of Economic and Social Affairs Public Administration Division; and others spoke about their organizations' interest in partnerships. Mr. Mejia announced a $100,000 donation to the Foundation, and others announced specific donations or offers of intellectual collaboration. Jeanne Stillman was elected for a second term as a Middle Atlantic Representative to the United Nations Association of the USA Council of Chapters and Divisions Steering Committee. David Stillman, a founding member of the Public-Private Alliance Foundation, was named Executive Director at its first board meeting. PPAF was incorporated to provide support to goals of the UN Public-Private Alliance for Rural Development. At this meeting Jeanne Stillman was named Secretary of the Board. David Stillman served as Rapporteur of a Regional Consultation on Migration, Remittances and Development, in Santo Domingo, Dominican Republic, which brought together 75 representatives from 13 countries. It was convened by the UN Development Programme and jointly organized with the Government of the Dominican Republic, the Global Foundation for Democracy and Development (FUNGLODE) and the Special Unit for South-South Cooperation, in keeping with the aims of the UN International Research and Training Institute for the Advancement of Women (UN-INSTRAW) and the UN Public-Private Alliance for Rural Development. ​Jeanne Stillman spoke at the Southeastern World Affairs Institute in Black Mountain, NC, on the subject "Peace Makes the World a Better Place," which highlighted the work undertaken by the Westchester Chapter of the United Nations Association of the USA in children's programming and in the cable access video series "Going Global with the UN." David and Jeanne Stillman participated in a Project Planning Meeting on Telehealth in the Dominican Republic at the invitation of the Dean of the School of Health Technology and Management at Stony Brook University in Port Jefferson, Long Island . Jeanne Stillman was named to the Board of Advisors of the Youth Symphony for United Nations. Founded in 2005 as a partnership between Friendship Ambassadors Foundation and the Symphony for the United Nations, Y-SUN imbues its youth and arts focus with a concern for issues central to the United Nations and global exchange. Y-SUN uses its local concerts and international tours to promote peace through cultural exchange, mutual understanding, global cooperation, and a greater role for youth in United Nations activities worldwide. Information is available at www.faf.org. David Stillman was elected to the Board of JumpStart International, a humanitarian organization which offers immediate engineering response in areas of conflict and disaster. "JumpStart International" is based in Atlanta, Georgia. David Stillman and Ambassador Francis Lorenzo of the Dominican Republic met at the United Nations with representatives of the National Money Transmitters Association to discuss migrant remittances and development and to lay the groundwork for a Latin American Regional Conference (see entry for July 2006). David spoke at the United Nations as part of the Ambassadorial Luncheon Program of CISRI ISP, the Inter-Governmental Organization for the Use of Micro-Algae Foods Against Malnutrition, International Spirulina Programme. David spoke at the Symposium, Sustainable Development: UN Initiatives and their Impact on Business, at the Iona College Hagan School of Business. His topic was the UN Public-Private Alliance for Rural Development. The event was co--sponsored by the University of Connecticut Center for International Business Education and Research (CIBER). Jeanne was named to the Planning Committee for the 2006 Annual Meeting and Convention of UNA-USA. She was also elected to the board of the Southern New York State Division of UNA-USA.David traveled to Geneva on behalf of the UN Public-Private Alliance for Rural Development to meet with ILO, UNCTAD, World Economic Forum, GAIN, Antennae-Technologie and other organizations. David assisted the government of the Dominican Republic to obtain a resolution by the United Nations Economic and Social Council (ECOSOC) declaring the Dominican Republic as the second pilot country of the UN Public-Private Alliance for Rural Development. David was named to the 2006 edition of Who's Who in America. David traveled to Madagascar to support local development of "Alliance-Madagascar" and to further relations between Alliance-Madagascar and the UN Alliance. Jeanne was elected member from the Mid-Atlantic Region of the Council of Chapters and Divisions Steering Committee of UNA-USA. As part of his work with the United Nations Public-Private Alliance for Rural Development, David spoke on "Madagascar: Building Alliances for Economic Development and Sustainability" at the Net Impact Conference, held this year at Columbia Business School. David and Jeanne served as guest speakers at Purchase College for the course "the United Nations and the Emerging Role of Cultural Diplomacy." Course organizer is faculty member Patrick Sciaratta. David spoke at the National Model United Nations Conference, the world’s largest university-level simulation of the United Nations, with about 3,000 participants. His topic was "The United Nations Public-Private Alliance for Rural Development." Jeanne and David presented a seminar on Leadership at the United Nations to the Leadership Training in Cultural Diplomacy program offered by Friendship Ambassadors Foundation at Wainwright House in Rye, NY. David addressed the International Trade and Remanufacturing Forum at York College, CUNY, speaking about the UN Public-Private Alliance for Rural Development, how it relates to export opportunities for Madagascar and import opportunities for the U.S. Mme. Elise Andrianarivelo also replied to questions from the audience about Madagascar and the African Growth Opportunities Act (AGOA). Organizer of the event was Mr. Al Abney, Director of the Remanufacturing Center at the College and a Rotary member. Jeanne was elected to the board of the Association of Development Officers as Mentoring Chairperson. She will establish a new program for mentoring new members who want to enter the development profession, either as their first position or in transition from another career. Jeanne traveled to Madagascar as a consultant to the Ministry of Agriculture, Livestock and Fisheries, to assist the Land O'Lakes International Division team and the Ministry to design a five-year Master Plan for Rural Development. Her role included writing materials on alliances and collaborations that might occur among public, private, non-governmental organization and donors in support of the Master Plan. ​She collaborated with the UN Public-Private Alliance team (of which David is General Manager) in developing materials, and wrote segments on cross-cutting issues: the environment, gender, health and nutrition, education, and other social concerns, with a focus on school nutrition. David spoke at a dinner commemorating the 50th Anniversary of the Rosamond Gifford Foundation, in Syracuse, New York. As a senior at Nottingham High School, he received a Rosamond Gifford Scholarship that enabled him to attend The American University School of International Service. He represented the 134 Rosamond Gifford Scholars. Chancellor Kenneth Shaw of Syracuse University gave the keynote address. Jeanne completed "American Freedom Association: promoting world peace for 50 years - 1953 - 2003," a history, to be distributed at the Southeastern World Affairs Institute, Black Mountain, North Carolina, July 25-27. David gave the keynote speech at the Model UN at Elmira College, Elmira, New York. David was elected President of the United Nations Association of the USA Westchester Chapter. Jeanne was elected Recording Secretary. 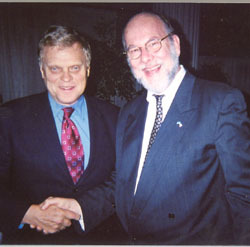 Both have been board members since 2002. Jeanne presented an abridged version of our course "Fundraising Updated" to the Ossining Breakfast Club. David and Jeanne served as panel members for a Rutgers University course on Mass Media, Government and Politics in the School of Communication, Information and Library Science. For a news article on the event, click here. Jeanne was elected to the Board of the Westchester Association of Development Officers, as Website Chairperson. Jeanne's article "The Nonprofit Sector’s $100 Billion Opportunity: A Review of the Study” appeared in Charity Channel's E-Philanthropy Review. Jeanne and Thad McKeown, of William B. Meyer Inc., presented an orientation to Emergency Preparedness to the Non-Profit Council of the Westchester County Chamber of Commerce.